On a cold and windy November morning, so early that it was still dark, we flashed our passports at the gate guard on the way into Camp Kim in Seoul, South Korea. We were trepidatious, but excited. Just like knowing you are going to cringe and scream in a horror flick, going on a tour to a war zone will really get your blood pumping! We were signed up on the famous USO DMZ Tour. In true military fashion, what do those initials mean? U.S.O is the United Service Organization and the D.M.Z. 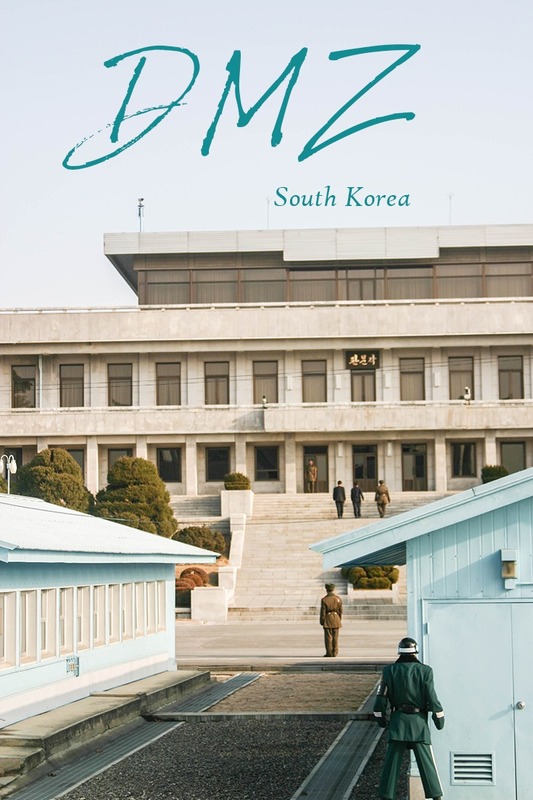 is the Demilitarized Zone between North and South Korea. I’m not big on tours. I try to avoid them at all costs. However, there are some places you just can’t go on your own. Whether this is because of danger – to people or to the grounds- or just to get more money out of you, there are definitely places you must take tours. It’s okay, though. I’m willing to let someone take care of me when I’m in an active war zone. We boarded our bus, and since the frost had not been scraped from the windows, tried to nap on the drive. Like just going on a tour in general, the fact that it was a gray wintry day, felt right. No one wants to visit someplace somber in the spring or summer with the birds singing and the sun shining. You want the weather to reflect the mood. It was perfect! As we disembarked at Camp Bonifas, we felt the same pleasant anticipation of being someplace special, new and exciting. We were ready to listen, learn, and take lots of photos. After all, it was just another tour. Heck, I’ve taken a lot of tours! If we were a bit lackadaisical, a bit nonchalant, we were quickly put in our place by the sergeant that met us at the bus and took us into the briefing auditorium. Here we saw slides and listened to the history of the Korean War, the base, the armistice, and the current DMZ situation. It was not filled with roses and happy endings. As the war is technically still going on, the guards who are entrusted to protect their side of the border are hand-picked patriots. They are trained to be on high alert, think of a German shepherd protecting a house with a six-foot high fence around it, and are ready to kill in an instant. In fact, over the years a number people have been killed, sometimes brutally, because someone made the wrong move. It happened to them, but would it really happen to us? He assured us that…it could. From that moment on, the tone of the tour dampened. All of us, our small contingent and the thirty or so others that chose to do the tour that day, were quiet and watchful. Our next stop was one of the most exciting of the day. We toured one of those metal blue buildings. 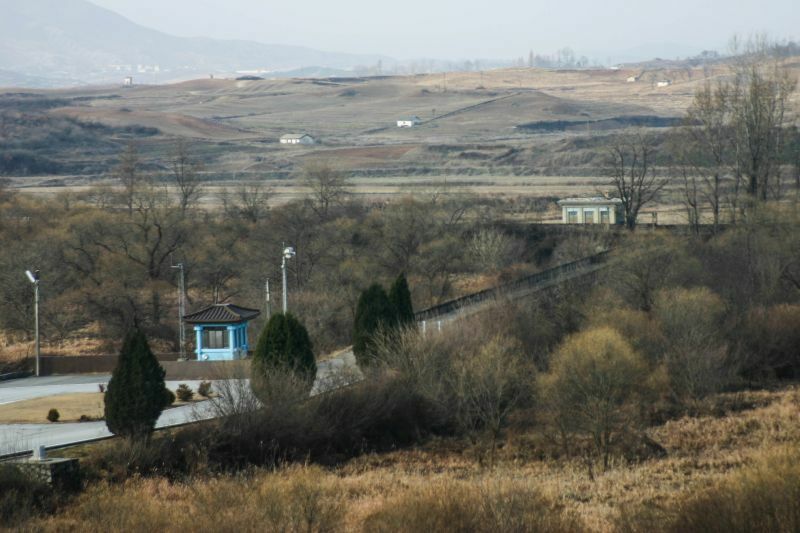 The demarcation line splits it, and on one side you stand in South Korea then on the other North Korea. 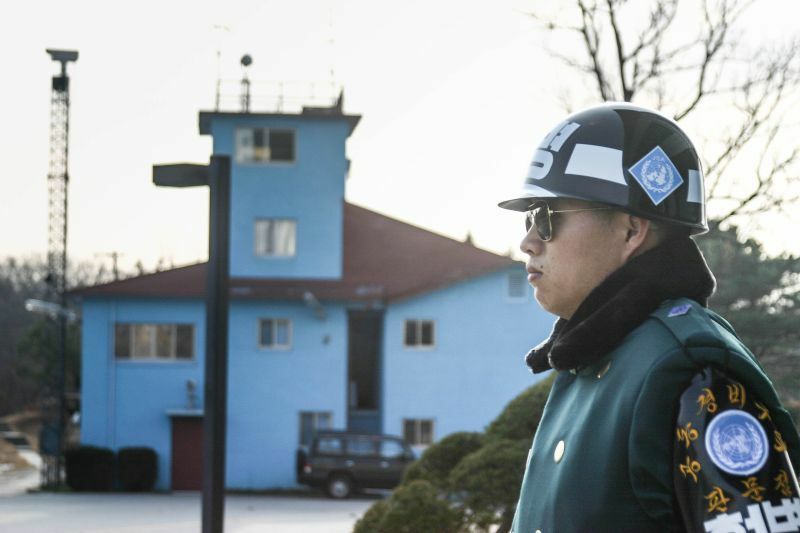 There were guards everywhere; South Korean guards, North Korean guards. 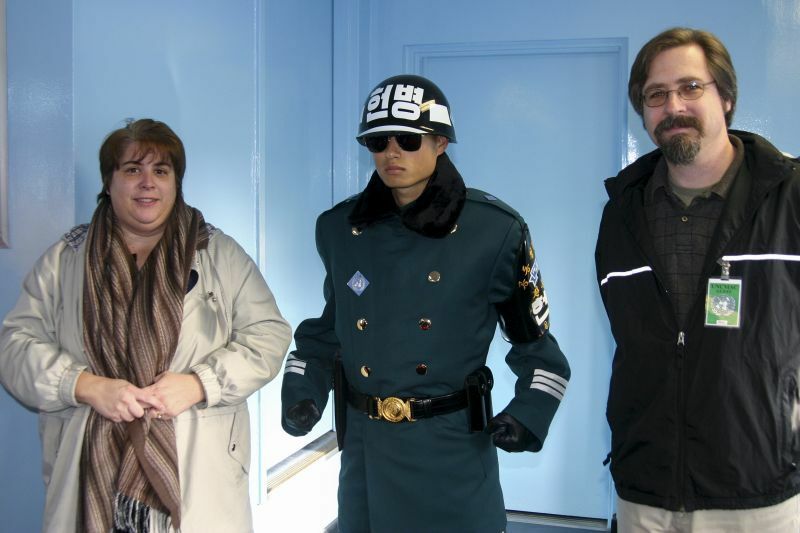 The South Korean guards are taught a very intimidating stance where they arch their shoulders, jut out their heads, and look mean and ready. 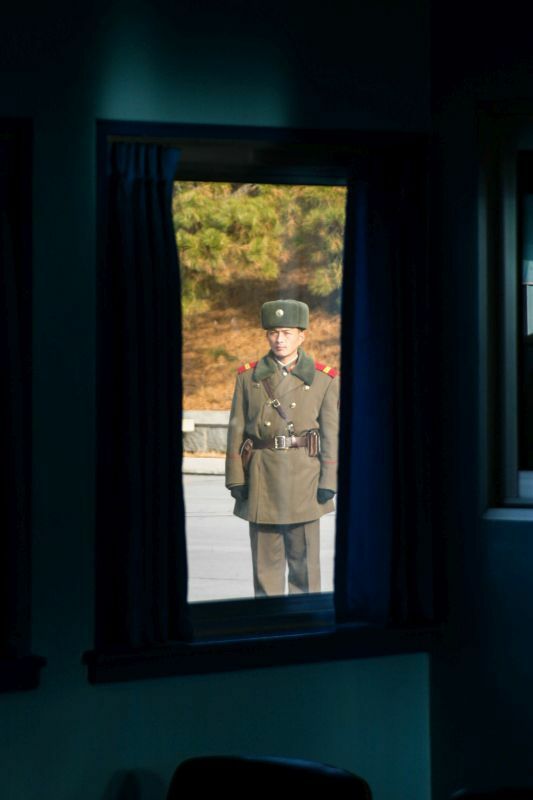 The North Korean guards just stood there and stared at you, really at you, with a chilling look. I know which one made me more scared. Everyone took turns having their photos taken with one of the South Korean guards behind the table, technically in North Korea. Then we moved on. 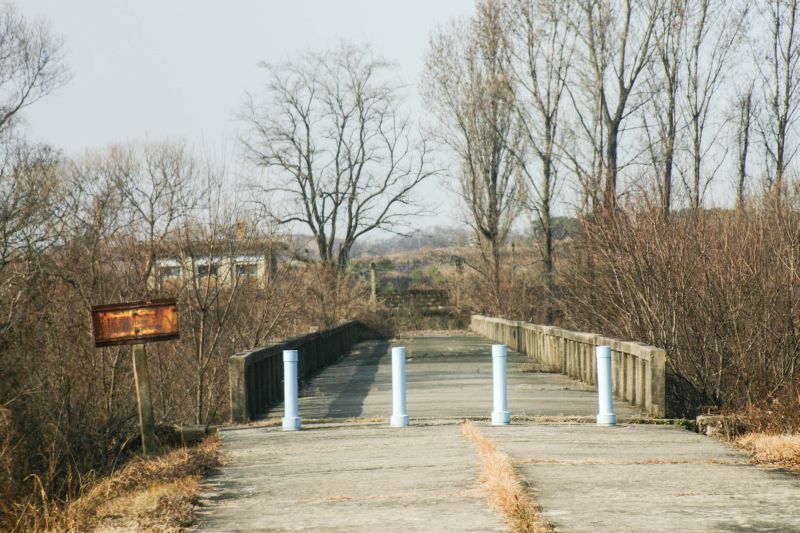 We visited the small bridge spanning the Imjingang River and peered over the DMZ into North Korea. Plenty of lush flora, wild and teeming with wildlife, the other side looked just as barren and uninviting as you might imagine. According to the sergeant, the city we saw, was fake. It was built to impress us westerners or perhaps even to entice us to defect. It didn’t work. 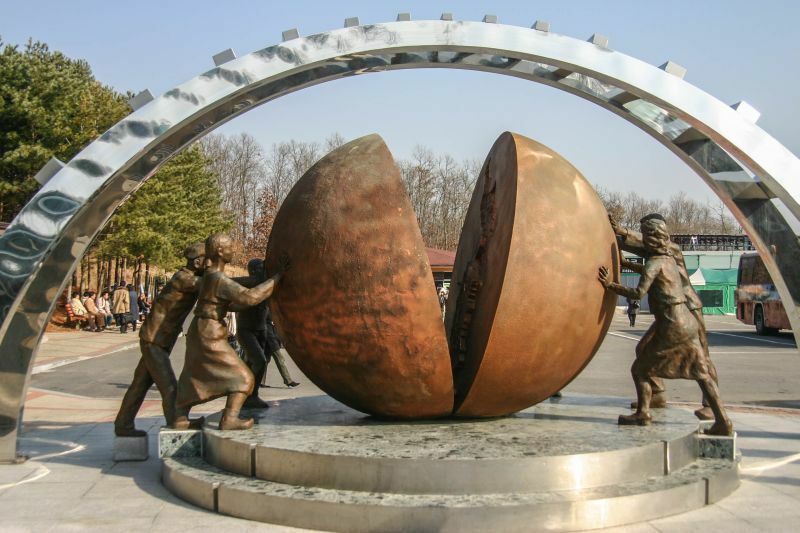 From Camp Bonifas, we reloaded our bus and headed to the Peace Park where you could go down into a tunnel and walk around the Memorial and Peace monuments. 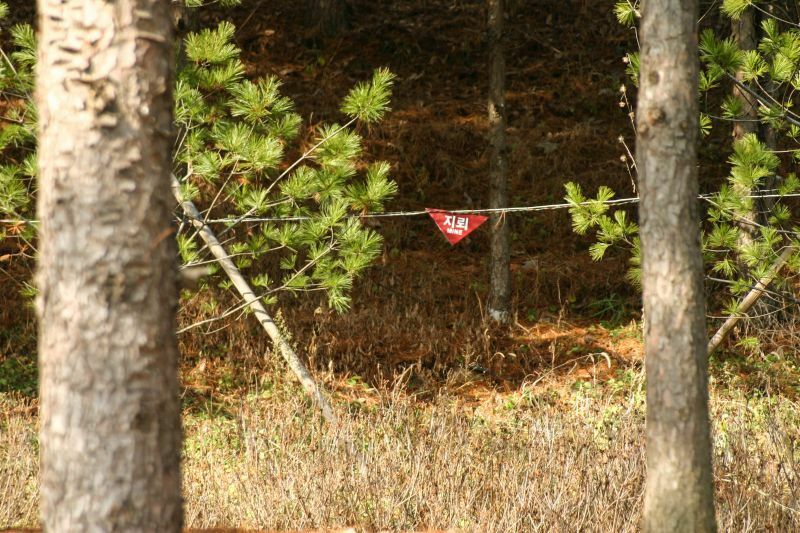 We were told not to wander too far off the path, though, buried mines still existed and it were still lethal. 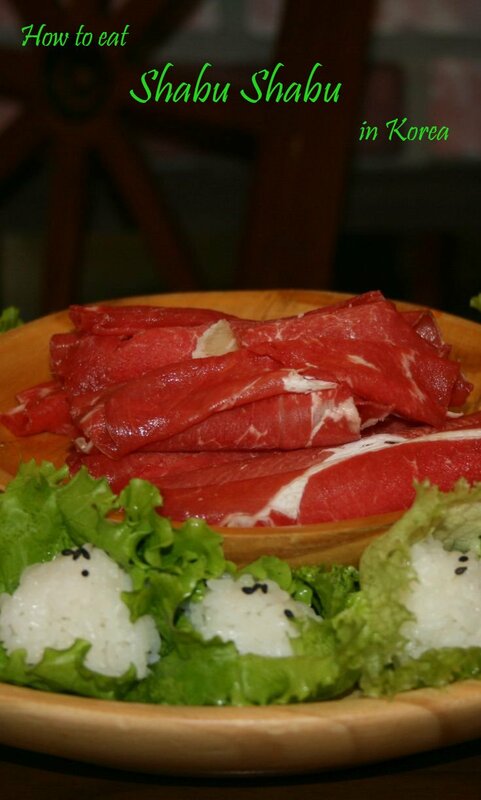 The tour concluded with lunch at a buffet restaurant where we all had Bi Bim Bap, usually one of my favorite Korean dishes. This one was tasteless, a fitting end to our eye-opening day. It definitely made us think differently about our situation living in South Korea, so close to an active war zone. 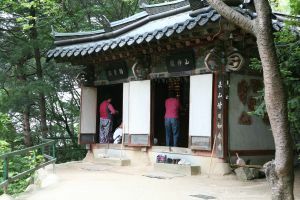 There are plenty of cool places not far from Seoul to head to on a day trip. We’ve been to many of them at least once, and many we’d love to return to as well. 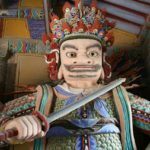 Have you traveled to South Korea? 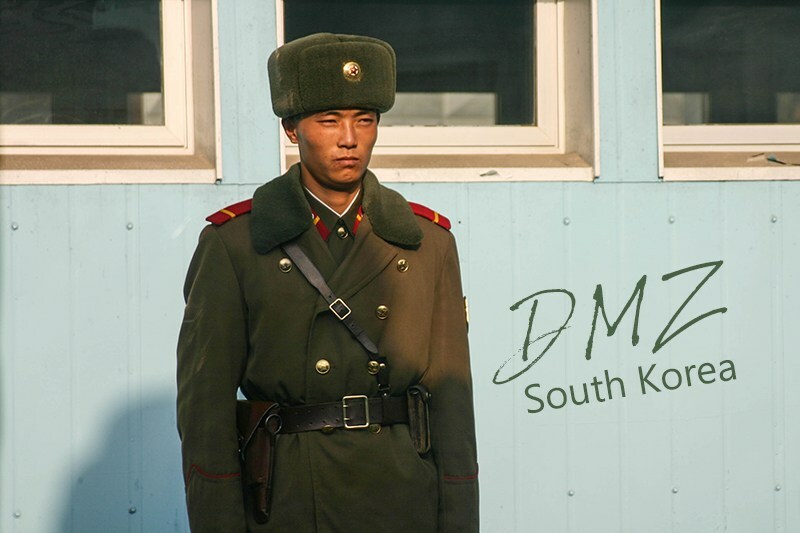 Would you visit the DMZ? I was a young army officer in Korea in 1975-77 serving in an explosive ordnance disposal (EOD) unit in Uijongbu (south of Camp Casey and the DMZ). We had DMZ passes because every time it rained, landmines and unexploded munitions were uncovered … so we were frequent visitors. 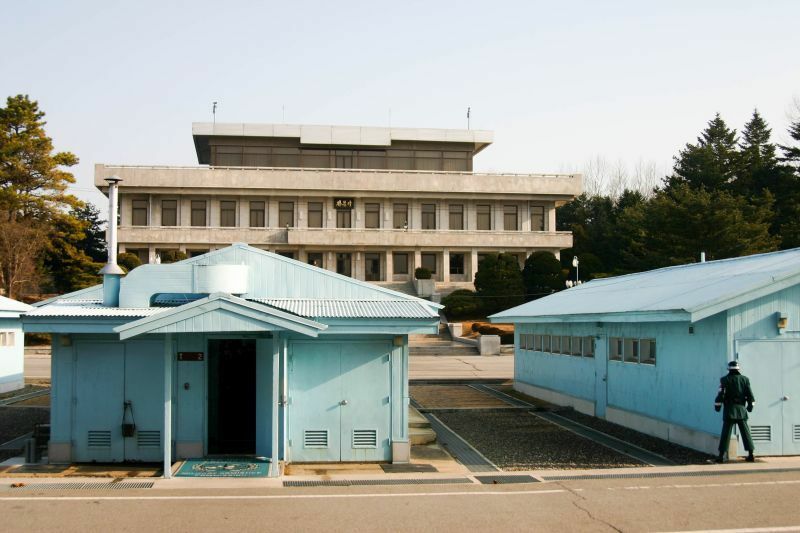 I was there during the notorious August 1976 ax murder incident, when North Korean soldiers killed a U.S. Army major in the DMZ; we almost went to war. 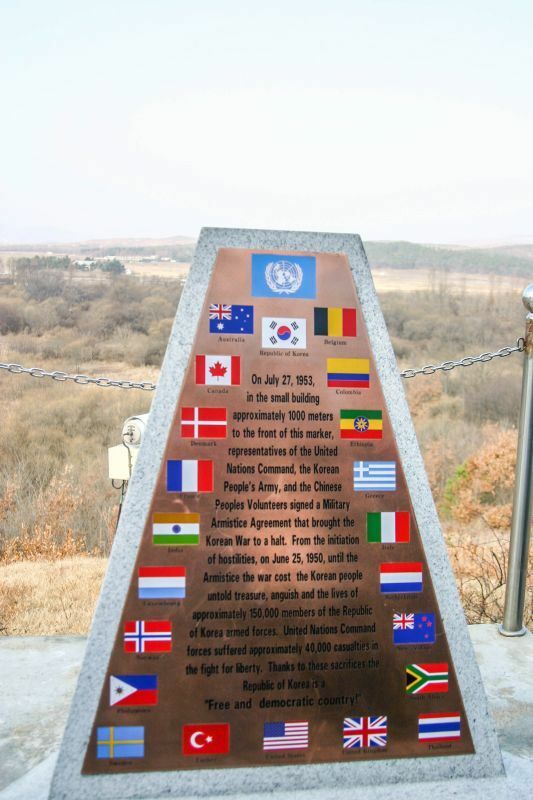 One weekend Spring 1977, several of us decided to find Pork Chop Hill (a famous Korean War battle site). Armed with maps from the official 8th Army History and our DMZ passes, we climbed in a jeep and drove deep into the DMZ, passing through several armed checkpoints and abandoned villages, quite a spooky experience. The battle site is in the Korean sector. We were able to see Pork Chop Hill, pretty much just a bald knob, before being turned around at the final checkpoint at the barrel of an M-16. Joe, Wow! Spooky is right! I felt that way with lots of people around me. I can’t imagine just a jeep-full. Such an interesting post it must have been quite an experience! Becky, It was pretty interesting and illuminating. It truly was a travel learning experience. I recommend it to all! Wow, This is really interesting, frightening and bizarre that I hung on every word and read several of the sentences to hubby. Do you think he was serious that it could happen to you . . . the fake city on the other side . . . Yes, given the opportunity I would do the tour. You have intrigued me. Rhonda, By far one of the most memorable tours I’ve ever taken. If you are in Seoul, do it! Thanks for taking me along vicariously on your tour. I had previously floated the idea of us taking this tour to hubby, and he promptly shot it down. Seeing it through your eyes is probably the closest I’ll get to it. Michele, It was a great tour, but in all fairness, it could be somewhat dangerous. Mike, Thank you. It was a eye-opening, memorable day. You absolutely would love it! Wow. I loved reading about this experience. And you two have really been everywhere! I can only imagine the mood of that tour. I don’t know if this is something I would do, so it was so nice to go on it vicariously through you! The situation between the Korea’s is so heartbreaking. Anna, It really is. Before I went, I’m not sure I fully understood the gravity of their situation. It was definitely an eye-opener. Wow, this sounds like a really interesting, and also scary, tour. You must have learnt so much and must be amongst a very small number of people who have had this unique experience. Thanks for sharing! Marcella, It is one of the best tours we’ve ever done. Michelle, Yes! It is a bit crazy, but it’s an eye-opener and well worth the trip! Super fascinating Corinne. 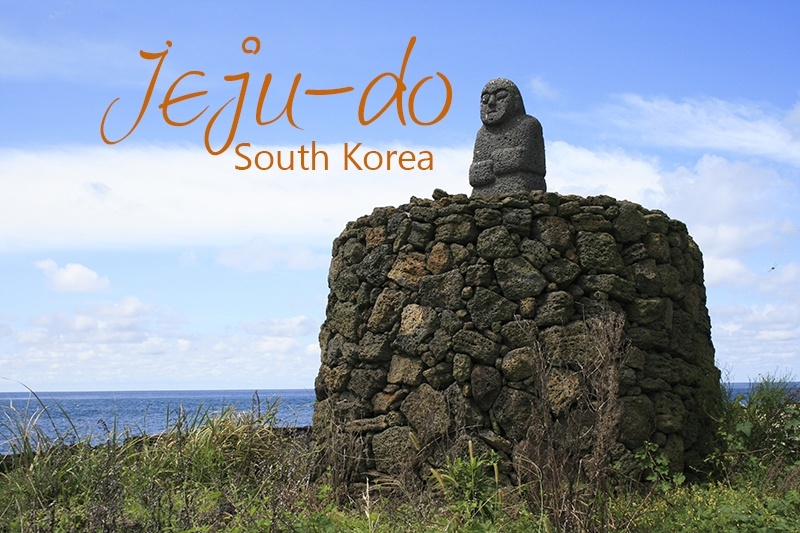 I think if I were in South Korea, I’d probably try to find a tour into this area. So interesting, especially to see it in real life. Adelina, No doubt. You really should! I’d love to go and see this part of our globe. Such a fascinating (and still is) part of our history. Thanks for linking up with us for #SundayTraveler. SJ, It was a very interesting tour if you ever get over to South Korea!